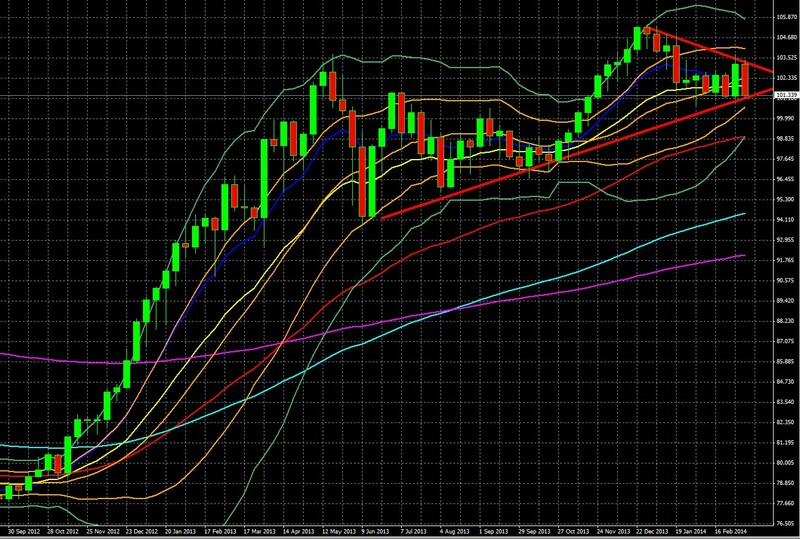 First we look at the longer term view from the weekly chart below. Weekly USDJPY Chart February 19 2013 to March 14 2014. Bullish Pennant Pattern: Convergence of the longer term uptrend and shorter term downtrend forms a “pennant” chart pattern. It’s a continuation pattern and so given the former steep uptrend, it suggests a coming bullish breakout from the recent trading range that awaits confirmation by a move higher. Neutral Momentum on Weekly Chart: The pair remains stuck in its double Bollinger band neutral zone, suggesting more flat range bound trading with momentum stuck in neutral. Key Levels To Watch: See daily chart and commentary below for likely coming week key support and resistance levels. Daily USDJPY Chart November 10 2013 to March 14 2014. Downward Bearish Momentum On Daily Chart Below: Given the pair’s 4 consecutive days’ lower closings; it’s firmly in the double Bollinger band sell zone, suggesting sustainable downside for those seeking to open new short positions. The 10, 20, and 50 day EMAs are also turning downwards. As with stocks, this reflects the effects of the Crimean crisis and latest batch of weak China data that drove risk asset markets down hard last week. The pair closed last week at strong support around 101.34 (both the price level and weekly uptrend line serving as dual support), returning its monthly lows. It would take a confirmed break above resistance at the 23.6% fib level around103.35 to re-establish the uptrend on the daily chart. –The USDJPY tracks the gap between US and Japanese government bond yields. The flight to safety drives up demand for US treasury bonds, drives down their yields, and narrows gap between US and Japan government bond yields, and thus boosts the JPY vs. the USD. If U.S. yields don’t rebound soon and drop to 2.5%, the USD/JPY could fall to new 2014 lows. –Closing of carry trades means further JPY buying, because the JPY’s low interest rates make it a preferred funding currency that is sold in order to buy a higher yielding currency (or related instrument like a bond) and profit on the interest rate differentials, because borrowing costs are lower than interest income received. See What Everyone Must Know About Currencies: Profiting From Risk Rankings Part A for details. –See our special report, Ukraine Crisis Escalation Winners, Losers & How To Profit, for further details on how to play the ongoing standoff, its escalations, and de-escalations, and likely outcomes. –Note that over the weekend there have been reports of Russian forces continuing to build up in Crimea, and even of Russian troops moving into other parts of Ukraine. -Trader Positioning Crowded to Long Side: In the latest CFTC IMM report, speculators added to their long USD/JPY positions this past week. This is bearish for the pair because it makes the USDJPY more vulnerable to a selloff as the position is crowded with more recent, weak hands. This data is over a week old, but still telling. The chart below is a real time sample of 228 traders (average holding period eight weeks) as of the close of Friday March 14 trading, which also shows a slight rise and so confirms the larger CFTC data. This Week: If there is any respite from fear of escalation in the Crimea, the upside surprise in non-farm payrolls, retail sales and jobless claims along with the prospect of tapering by the FOMC this week could support the dollar. See below for top calendar events that could also move the pair later in the week. The Difference In Central Bank Policy Direction: The Fed is moving towards tightening (slowly), the BoJ is moving towards easing. Japan-Specific Geopolitical Risk: Japan’s standoff with China over a few small Islands (and their mineral rights) and China’s increasing aggressiveness in expanding its territorial waters. The past week brought another confrontation, this time with a Chinese blocking of two Philippine commercial vessels, which brought another warning from Washington. 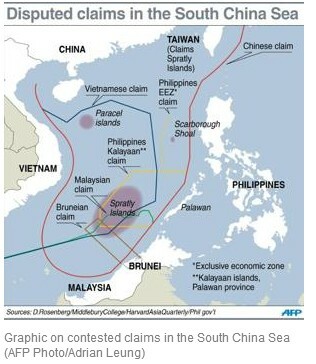 The graphic below illustrates the number of potential points of escalation with China besides those directly involving Japan over its recently expanding assertion of what it sees as its territorial waters. Any escalation in any of these areas could hurt the JPY (and thus boost the USDJPY) given Japan’s proximity, even though normally the JPY benefits from rising market fear. Japan’s 200%+ debt/GDP, sustainable thus far only because of the very low rates on JGB’s that have been supported by strong domestic demand. A mostly empty Japanese economic calendar leaves the USDJPY to move with US events and overall risk appetite. The vote in Crimea and responses from both sides to it, both real and anticipated, are the likely market movers early in the week. On Wednesday the FOMC rate statement will be the focus. Although no material changes in Fed policy are anticipated, this announcement includes a quarterly assessment of the US economy, and could reveal hints about the Fed’s outlook on when it might begin raising rates. Any unexpected tinge of hawkishness could help send the pair higher, and vice versa. For details on the rest of the week’s top calendar events, see our EURUSD weekly outlook. The USDJPY weekly forecast: Short term (this week) bearish, long term bullish. See above for significant support/resistance. It’s hard to see the Crimean crisis doing anything but inflicting more uncertainty, for reasons noted both here and here. Therefore we see at least a test of one or more support levels noted above, depending on if things escalate there, and how fast. Big geopolitical issues with longer term economic and/or military implications tend to override data and calendar events in the short term. The likely most bullish scenario would bring the pair back to recent resistance around 103.25.